Professional Oils and Saline Vocal remedy in spray form for Vocal and Sinus repair and Maintenance. The perfect solution for mild symptoms for people on the go. Suitable for: This vocal remedy product is a voice spray intended for those who tend to have excessive sinus issues, post nasal drip, frequent pharyngitis, throat infections and excess mucus in the mouth. The Saline and Oil Spray is known for helping singers to feel the sensation of ‘openness’ of the resonance cavities (sinuses). Description and effects: The voice spray used as a preventative measure to relieve hoarseness, inflammation around the vocal fold area. The Saline and Oil Spray helps boost the body’s natural immunity against bad bacteria and winter ailments. 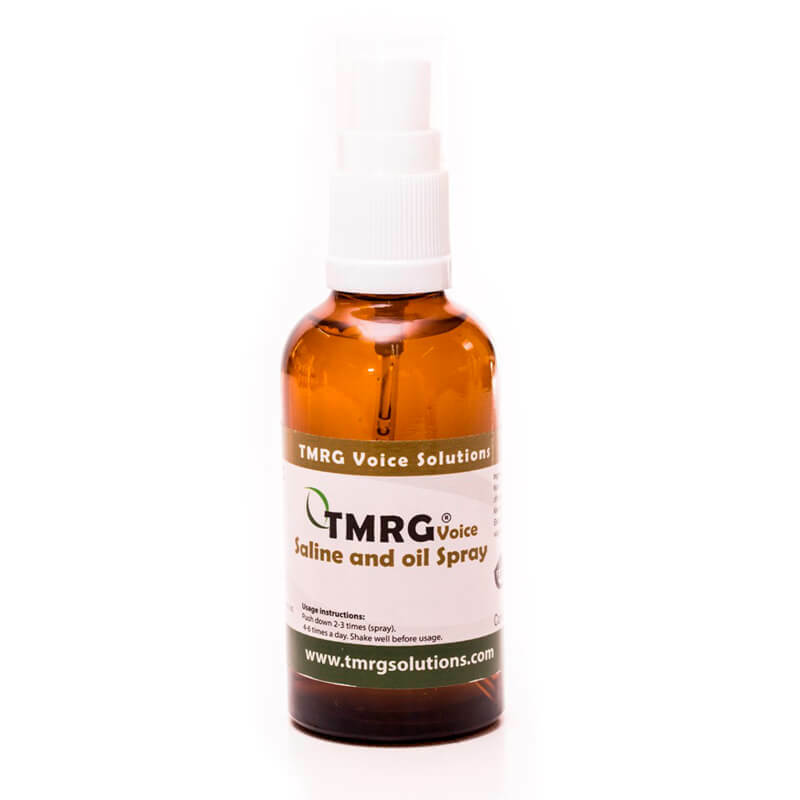 The voice spray is very useful as part of an ongoing general vocal maintenance routine. Use as needed up to 4-6 times a day. Recommendation: Recommendation: To be used regularly if one has a cold or suffers with chronic allergies that tend to obstruct the nasal passages and feelings of resonance. We advise to also take TMRG Classic/Voice Power drops in addition to the saline and oil spray, particularly if the symptoms persist. How to: Two squirts directly into the back of the mouth each morning during winter and during the transition between seasons. This is a preventive measure to help boost the body’s natural immunity against bacteria and winter ailments. Water, Salt, Rosmarinus, Officinalis oil, Lavandula angustifolia oil, Mentha piperita oil, Eucalyptus globulus oil, Elettaria cadamomum oil, Thymus vulgaris oil, Cymbopogon citratus oil. Storage: in a cool dry place away from direct sunlight. Expiry: within 3 years form manufacture date. TMRG is a great remedy for a myriad of different vocal problems, but if the condition is chronic, complex or severe, e.g. – vocal fold blisters / edema etc, – it is highly advised that you consult the advice of a Doctor or ENT specialist in addition to using any of our specialized kits that deal with more serious vocal issues. Always consult your doctor or ENT specialist. All TMRG solutions are dietary supplements, not medications. Pregnant women, breast-feeding women, persons taking prescription drugs and children should consult a physician.